A man charged with the murder of a woman at her home in County Fermanagh last year has appeared in court. Joseph Dolan, of no fixed abode, is accused of murdering Pauline Kilkenny, 59, between 6 and 14 November. The 28-year-old is also accused of stealing her car and perverting the course of justice by falsely implicating someone else in the murder. Ms Kilkenny's body was discovered at her remote rural home on the Cornacully Road between Belleek and Garrison. At a preliminary enquiry in Enniskillen, Mr Dolan was asked if he wanted to say anything in answer to the charges or give any evidence. He replied: "Not at this moment." A prosecution lawyer said there was a case to answer and the judge agreed there was a prima facie case. 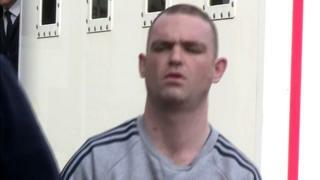 He was remanded in custody to appear for arraignment at Dungannon Crown Court on 7 May.